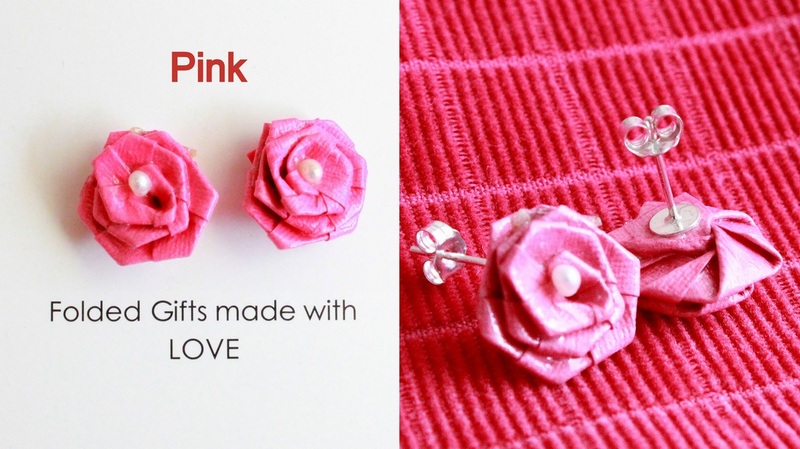 Rose is a popular symbol for love, beauty, courage, passion, respect and romantic love. 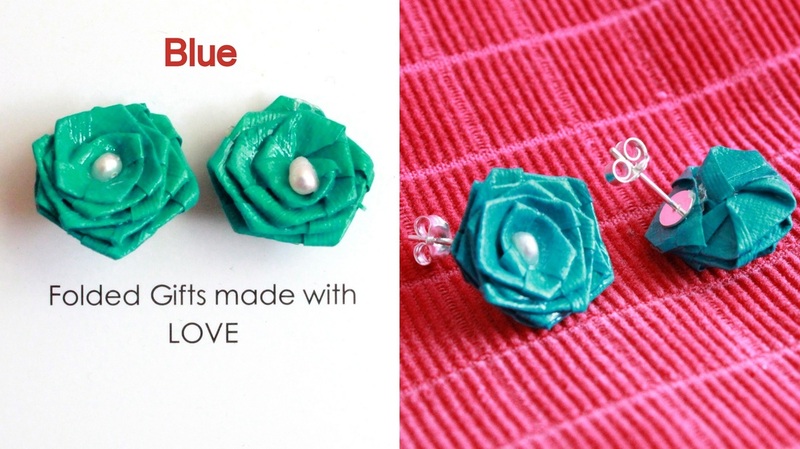 Unique Rose origami earrings are hand folded and polished with water resistant coating. 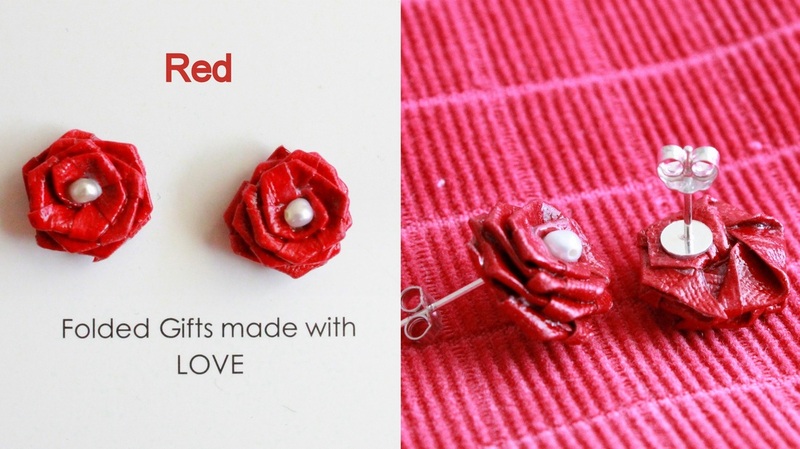 Beautifully assembled on sterling silver stud with loop and attached with Fresh Water Pearl. Rose symbolises, love, passion, beauty, romance, gratitude, and good health. This piece is so unique and versatile you can wear it for special occasions or simply a daily wear that is eye catching as conversation starter. Perfect gift ideas or simply spoil yourself. Unique Rose origami earrings are hand folded and e polished with water resistant coating. Beautifully assembled on sterling silver and attached with Swarovski crystals. Roses symbolises, love and passion. This piece is so unique and versatile you can wear it for special occasions or simply a daily wear that is eye catching as conversation starter. Origami Rose with stem and leaves. 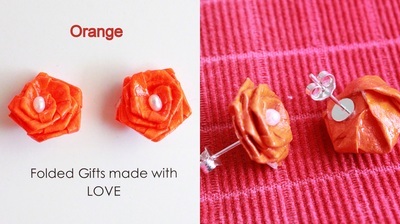 This beautiful origami rose are made from washi paper and polished with water resistant lacquer which gives a long lasting effect. there are colour options available. 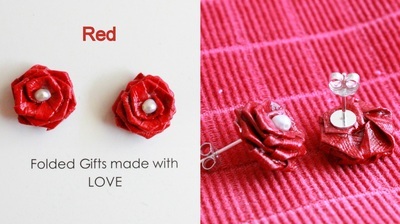 Red rose represents long lasting love and passion. Yellow represent strong friendship, get well. White rose represent true love, purity and innocence, and sympathy. Roses are beautiful great way to cheer your love ones up. Great gift ideas for special occasions. Beautiful hand folded rose and leaf are made from high quality washi paper polished with water resistant lacquer gives a long lasting shine. 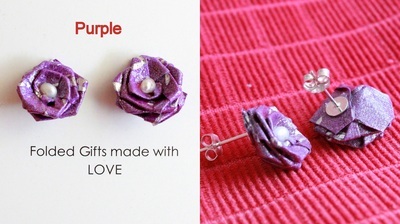 Rose is assembled with sterling silver and 2 Swarovski crystals and a fresh water pearl on each piece. Roses represents love, passion and endless love. 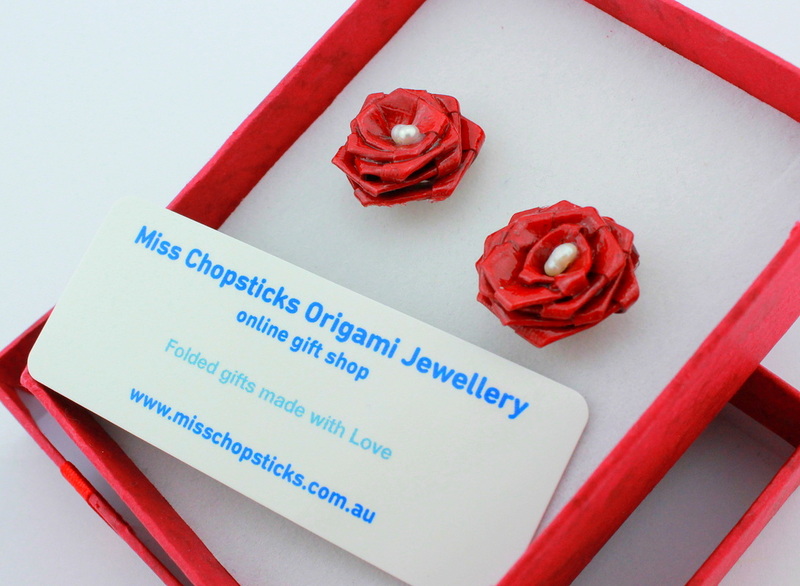 Great gift ideas for your special one or even spoil yourself. Buddy Mini Rose - 2 Green Swarovski Crystals and 3 silver balls on domed stud with loop. The warm feelings associated with the yellow rose are often akin to those shared with a true friend. 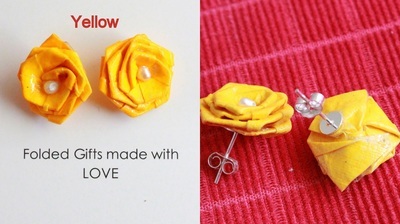 As such, the yellow rose is an ideal symbol for joy and friendship. Each piece is attached with 2 Swarovski Crystals and 3 silver balls in each rose. Origami rose are hand folded and painted with water resistant protector give extra shine. Roses also symobilse love, faith, beauty, passion and sensuality. Each origami piece are made from traditional Japanese 'Washi' paper, and polished with crystal strong water resistant lacquer to give a long lasting shine. 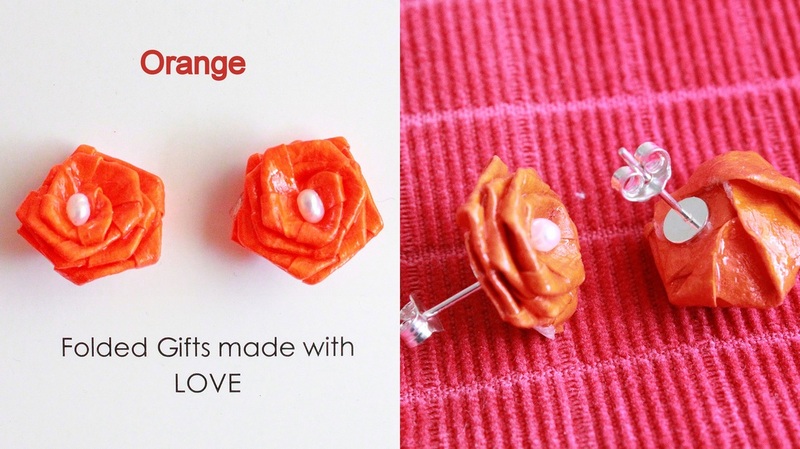 Mini Rose swirl origami earrings made with Japanese 'washi' paper and polished with strong water resistant lacquer gives a long lasting shine. 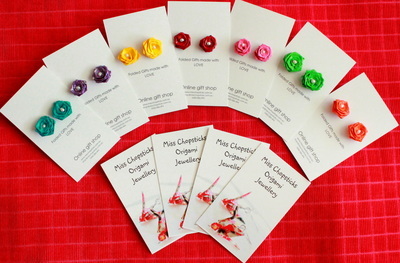 This pair of unique origami earrings is so versatile, you can wear it to dress up or a casual look. These roses will blossom throughout all seasons. A perfect gift to bring out a promising smile on your love one's face. Love is in the air! Ravishing handcraft Rosie Swirl Origami Earrings with Swarovski Crystals and 2 silver balls pendants. Each origami piece are made from Washi paper and polished with strong water resistant lacquer gives a long lasting glow. They are stunning and definitely blossom during winter and all seasons. A perfect gift to bring out a promising smile on your love one's face. 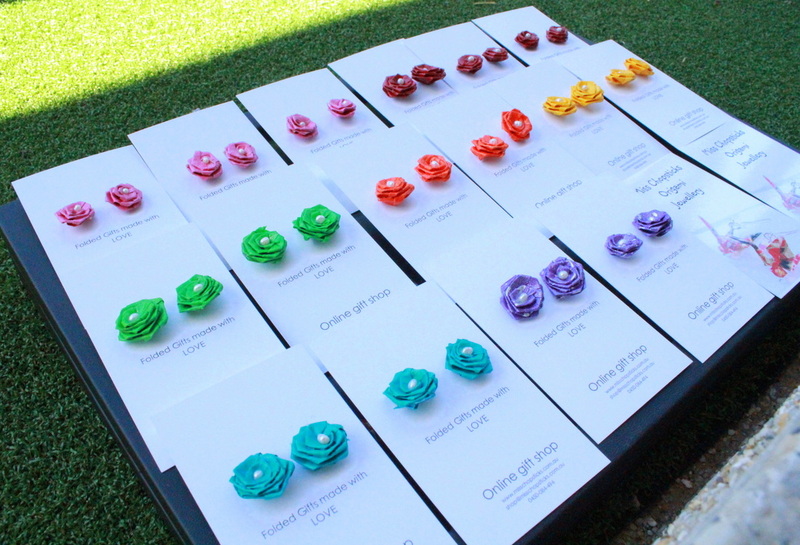 Handmade origami earrings are made from Japanese 'Washi' paper, polished with strong water resistant lacquer. 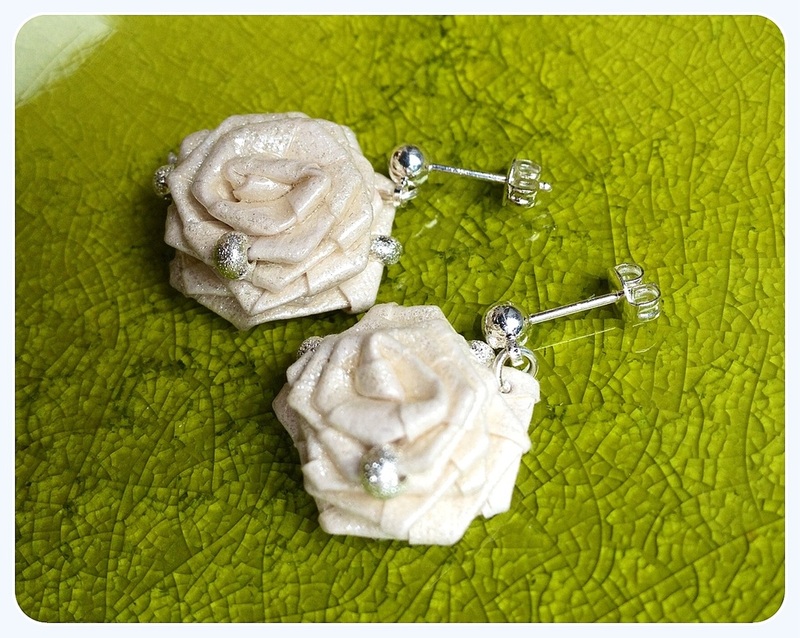 3 silver ball are attached to each rose, handcrafted on domed stud with loop that dangles with the delicate rose. 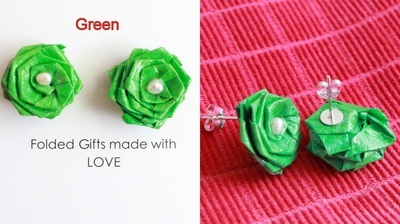 These earrings are so versatile; you can wear it with formal wear or a casual look. They will blossom throughout all seasons.